Urban casual, retro, boho chic, what is HER design style? WallpapHER Wallpaper. A pattern book with wallpaper for her. Lets look at the designs. With funky names like Divine, Dream Weaver, Obsession, Boho Chic and Serpentine Scroll you know that they are going to wow you. 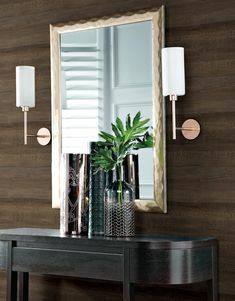 The dual patterns on this wallcovering work so well together. The field is a myriad of tiny squiggling lines intersecting in irregular shapes. Artfully superimposed on that crackled mesh ground is a swooping, swirling, bold but graceful, scroll design composed of glittering raised ink. The marriage of inherently diverse forms begets a lighthearted, yet lovely, addition to bed or bath. Select from six hues including matte black, pearl, and white and incorporate Vibe or Primal into the project. Divine available from WallpapHER Wallpaper. This quiet design is hushed and very fine, a textile look-alike with a minute woven pattern. The miniscule texture of this wallcovering is enhanced by the slight variations in colour. Select from four versatile neutral shades, grey, silver, oatmeal or linen…or opt for an intense orange, demure pink and more. This is a subtle and flattering companion for Vogue or Spiral Dance. Shoes, shoes, and more shoes! And purses, too. What woman ever has enough? A perfect balance of fashion forward whimsy and on trend hues, this wallcovering begs to live in your bedroom, dressing room, or bath. What a chi-chi focal wall for a young fashionista. Select from cherry fizz with warm pearl, frosty lilac with pearl satin and four more striking duos. Use it along with Vogue or Primal for maximum effect. This boldly feminine adaptation of traditional damask begs to be worn as a mantilla by a Flamenco dancer. But wait, this isn’t lace! This is a remarkable wallcovering whereon large, graceful medallions appear to be embroidered on Alencon lace. Raised inks add to the illusion of delicate fabric and vibrant colours such as cobalt blue, lipstick pink or turquoise against neutral shades add to the depth of the ornate pattern. Coordinate with Primal or Empire for a stunning look. This on-trend wallcovering augments Mother Nature’s palette. Who knew an alligator could be turquoise; a crocodile, magenta? The faux leather look has the realistic appearance of scales but the colours are from the paint box of the imagination. Choose from white patent leather, iridescent pink and more. Unleash this fantasy animal with Boho Chic or Empire for a striking effect. This wonderfully audacious wallcovering makes a powerful statement. The scale is bold; the message is organic, with faux crock as the field and large, lacy scrolling leaves in the forefront. The raised inks are further embellished with metallic touches. Incredible colour selections include matte taupe and glittering silver with stone grey or patent leather white and cobalt blue, with turquoise silver glitter plus four more. Use Primal along with this spirited design. A cosmic dance, a spiral collision, a super nova, a galaxy of colourful dots imploding in an ogee pattern. What fun this wallcovering brings to the bold at heart. The unique design and colour choices make this design a must have for a modern or contemporary apartment, foyer or home office. Check out international orange with raised shiny gold and red dots, or pearl white, and obsidian black with bright silver plus four additional unusual colour combinations that work well with Dream Weaver or Primal and others. It’s a fantasy world where cosmic vines in a spiral dance produce galactic leaves and solar flare flowers! This retro wallcovering has a sense of humour that is enhanced by the contrasting colours and pairing of shining and matte inks. There are five colour selections including a bright and lovely pearl, magenta and champagne cocktail combination. Perfect for a striking focal wall, it would be enhanced by Serpentine Scroll or Vogue in compatible shades. Cleverly placed petals form an over all pattern that is a twenty first century version of a 70’s design. Like a daisy chain, simple and girly, this wallcovering is a whimsical charmer. The six in-your-face colour combinations, like magenta or turquoise with brushed silver, add a dash of panache. This pattern is divine with Obsession in coordinated colours. Big and bold, a softly glittering free-form design flows over a shining field adorned with retro rounded squares reminiscent of the ‘70’s. The inventive patterns play off one another to create a unique and intriguing contemporary design. The colors are engaging: pearlescent white, turquoise glitter and white or black onyx, golden glitter and black patent plus three more delectable selections. Marry with Princess Cut or Primal for optimum impact. An Alencon lace look-alike, this design would make a lovely gown or bridal veil, if not for the fact it’s a beautiful wallcovering. By printing the lovely traditional embroidered floral motif over delicate mesh with a satin finish the illusion of fine fabric is created. In a brilliant departure from the norm the selection of available hues, in addition to white and off-white, includes bubble gum pink! This gorgeous design partners beautifully with Boho Chic. 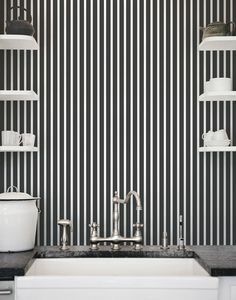 A bold theatrical stripe, this wallcovering is available in two colour combinations as different as noon and midnight, icy winter and blazing summer. The very wide stripes in matte finish alternate with smaller stripes in glittering metallic inks, including a narrow serpentine line. You can choose white with various intensities of silver or black with shades of gold. This dramatic design is flattered by Spiral Dance or Serpentine Scroll. They could have danced all night beneath the glittering chandeliers as the band was playing their song. Too bad she lost her glass slipper! How romantic, how enchanting is this whimsical wallcovering in matte and satin finish with lustrous raised and glimmering inks? The design portrays chandeliers in multiple shapes and sizes, some bold, some in shadow. The hues include blacks with silver or pinks with silver and more. Hang your chandeliers along with Dream Weaver or Primal to complete the mood. Fresh and fun, this retro wallcovering is up-to-the-minute. The doodle design of free-form rounded squares in an overlapping pattern brings a touch of the ‘50’s to your project, and the pairing of shining and matte finishes creates a visual delight. The colour selection offers iridescent gold with snow white and champagne pearl with pristine white plus three more. It is a great mix with Obsession. Thousands of fine squiggly lines are interwoven in an irregular pattern. The result is an organic looking mesh, a design that is very subtle and unobtrusive resembling a fine over-all crackle. This wallcovering is presented in soft tonal colour combinations; silver with pale grey, warm beige with taupe and two more. 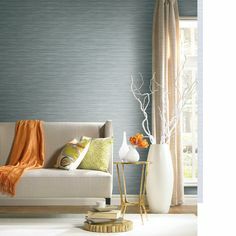 Its intended partner is Divine which would make an attractive focal wall along with this wallcovering.